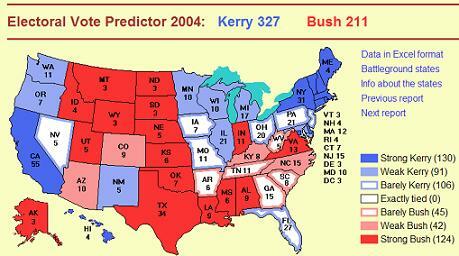 The next time one of the Clintons try to claim that Hillary is more electable because she is ahead in some random poll, just remember this page from the electoral vote website showing Kerry v. Bush on May 28, 2004, with Kerry ahead 327 to 211 electoral votes. As Ben Smith at Politico points out, “polls are wrong, and close, and above all — things change”. Or, as August Pollack smirks, you could point out that Obama will be much more electable than Clinton in the general election because his name will be on the ballot. This was written by Iron Knee. Posted on Thursday, May 29, 2008, at 1:16 pm. Filed under Humor. Tagged Clinton. Bookmark the permalink. Follow comments here with the RSS feed. Both comments and trackbacks are currently closed. electoral vote was probably right except they didn’t take into account caging lists. The man who runs electoral-vote.com is an American citizen who lives in Amsterdam. He teaches computer science (he created Minix, an operating system that inspired and evolved into Linux). During the 2004 presidential election, his site was one of the best sources for unbiased election data, and continues this tradition today. The point of my post was that Kerry was ahead in most polls six months before the election. So take them with a grain of salt. Which is exactly what this map shows. The election map was based on real polling data, and his site is very upfront about the process used to calculate these maps. I have to wonder who you would put much stock in. Say, Fox News? His site votefromabroad.org (not .com) helps US citizens living outside the US vote using absentee ballots. Why do you attack it?